Viva Hypnosis Gives Edinburgh Festival Fringe Audiences The Trance Of A Lifetime To Be The Stars Of The Show! At the Edinburgh Festival Fringe. Fresh from it’s UK theatre and Caribbean tour, Viva Hypnosis aims to redefine the art of the hypnosis show by getting rid of the ‘old hat’ stuff that people might expect and putting the ‘show’ back into stage hypnosis shows. 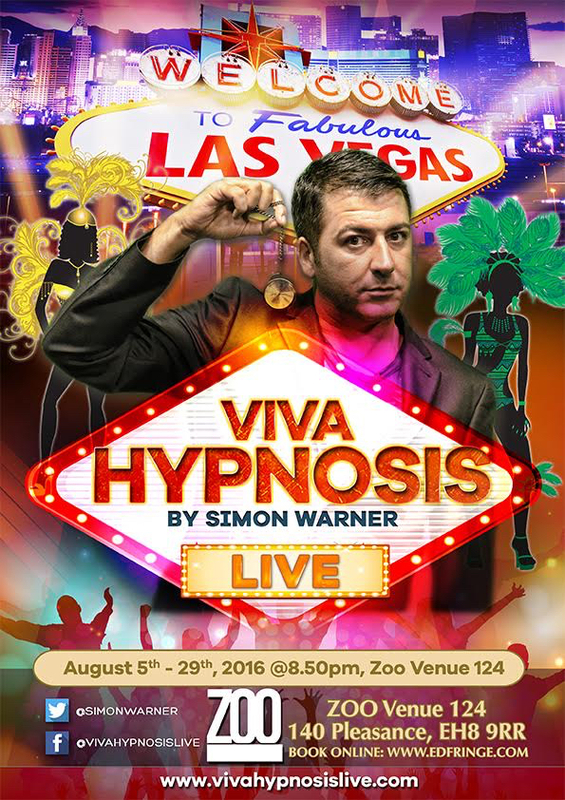 Fully loaded with dancers, mesmerising visuals, dazzling lights and legendary sing-along tunes…Viva hypnosis will transport you from the beautiful setting of Sanctuary at Zoo, direct to the hypnotic glitz and glamour of the Las Vegas Strip…A place where anything and everything is possible. All through the power of hypnosis. Volunteers from the audience will be encouraged to explore their creative imaginations and go on a hilarious Hypnotic trip to fabulous Las Vegas that they will never forget! Chauffeured by internationally-renowned stage Hypnotist, Simon Warner and his troupe of eye-catching show-dancers; The NTrancers. Viva Hypnosis is the UK’s FIRST and ONLY full-production, interactive comedy hypnosis show and it’s giving Fringe audiences the chance to be the stars. Over the past 10 years Simon has hypnotised over 5000 people all around the world, from the Canary Islands to Caribbean to the United States. Simon was once the warm up act for Vanilla Ice, performed at Walt Disney World and even performed at his own wedding with his bride as the techie! His troupe of ‘NTrancers’ have also performed all over the world, including with Britain’s Got Talent Finalists Flawless and as backing dancers for Tinchy Stryder at Wembley at the Champion’s League Final! 2016 is a busy year for Viva Hypnosis. The show will be heading off to (actual) fabulous Las Vegas, USA this Autumn, after a stop at the Liverpool Comedy Festival…so the Edinburgh Festival Fringe is a perfect time to catch it before it sets off on more hilarious hypnotic adventures around the world. Press, Media and Industry Professionals are welcome to every show.